While testing a new crop of facial oils, you’ve probably noticed I’ve been offering up a few more body oil reviews recently. Body oils are a bit simpler to review — they either absorb quickly or don’t, smell great or don’t and have cream of the crop ingredients or don’t. The ones I’ve shared (here, here, and here) are on my “love it” list and will most likely be restocked once my samples run out, but one that I can confidently say will be part of my permanent collection is Osmia Organics’ Stream Body Oil. One big reason Osmia Organics’ Stream Body Oil will be restocked is because of sheer common sense: It’s a lovely body oil made in two sizes — the lasts-for-a-long-time and inexpensive 2-ounce glass bottle — and it contains a great lineup of beneficial oils known for their moisturizing and healing properties. So of course you’ll see the usual suspects — coconut oil, jojoba oil and sweet almond oil — but you’ll also notice interesting additions of rosehip seed oil, hemp seed oil, avocado oil, borage oil, evening primrose oil and sea buckthorn berry extract. I became a fan of hemp seed oil back in the old junior high days’ obsession with The Body Shop’s offerings of “natural” products with moisturizing hemp seed, and while I’ve moved on from this store, I do credit it with opening my eyes to cleaner beauty back in the day. I’m intrigued to see more borage oil, avocado oil, kukui oil and sea buckthorn in beauty products. These oils are amazing on their own for both hair and skin, thanks to their high vitamin and omega properties, and to get them into one beautiful blend multiplies their benefits. My appreciation for Osmia Organics’ Stream Body Oil runs deeper than just the idea that it’s a more affordable option on the market. The smell — a refreshing geranium and juniper blend — is a perfect combination of floral and green that isn’t too overpowering. I think you could easily layer other products within the same scent family over this fresh scent, while other oils I love stand better on their own because of their distinct scents. The texture — a thick, hydrating treatment — requires just a bit of massaging in but then dries to a beautiful finish. As with my other oils, I use Stream Body Oil post-shower, or if I need a little extra moisture, I spray myself down with a bit of Evian Mineral Spray before patting in some Stream. Only real critique of Stream Body Oil: The packaging. I love a nice glass bottle, but I prefer pumps instead of small-opening tops (think of an olive oil top). My grubby, oily little fingers also do a number on the paper label, which is why I didn’t shoot an original picture of my bottle of Stream. Sadly, Stream lives under my sink in my body oil bin instead of getting a home out on display, but I suppose what really matters is that I constantly reach for this oil despite the packaging pitfalls. 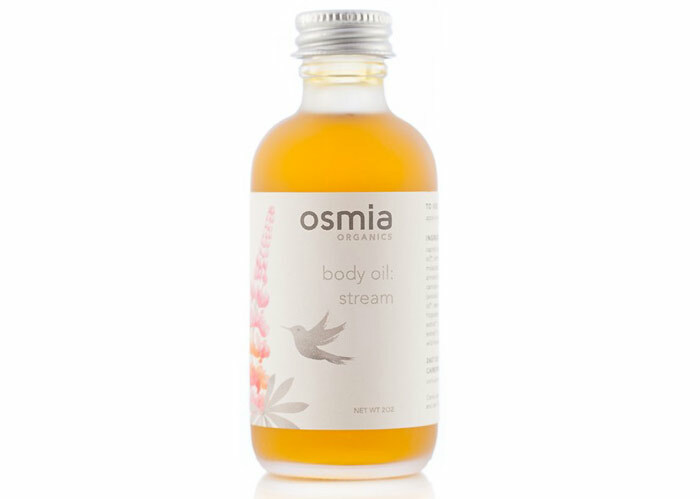 Have you tried Osmia Organics Stream Body Oil yet? Have you tried anything from this up-and-coming line? Tell me in the comments section!